Dumping household items in public trash receptacles is a fineable offense. New collection and transfer facility offers solutions to disposing of household goods. Pleasanton City Council members unanimously adopted the ordinance establishing rates, fees, rules and regulations for the use of the City of Pleasanton collection and transfer facility. It will be open to both Pleasanton residents and residents of Atascosa County. Comprising the council are Mayor Clinton J. Powell and council members Robert Leonhardt (Dist. 1), Kenneth Hernandez (Dist. 2), Diana Prasifka (Dist. 3), Eliseo Flores (Dist. 4), Robert Earl Wood (Dist. 5) and Travis Hall Jr. (Dist. 6). Hernandez was not in attendance. The facility will be located on Fourth Street, behind the wastewater treatment plant and will provide an additional resource to dispose of unwanted items and recyclables. 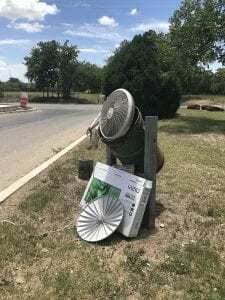 The ordinance sets a fee schedule with resident rates and non-resident rates for trash, appliances, furniture, mattresses and box springs, tires (no rim), lawn mowers (fuel must be removed), building materials, bulky items and brush. Misc. items (to be determined by the facility attendant) will have a minimum $2 fee for both residents and non-residents. There will not be a charge for recycle items such as plastic, newspaper, cardboard, mixed paper, aluminum, steel or tin containers. There will be a $25 fee for unsecured loads, as state law requires all loads to be secured. Council member Leonhardt asked about the $25 unsecured load fee and if that is just for loose material. Community Development Supervisor John Raney said that yes, it is mainly for loose material that someone would bring in a pick-up truck such as shingles, sheetrock, etc. The city also wants to make sure that people bringing items do not just drop off items on the street, which would require a waste of manpower to go back and pick up those items. Leonhardt asked if bagged brush or grass is okay, to which Raney responded that it is, because it is self-contained. Council member Hall asked Raney if he could reaffirm that brush and bulky pick-up in the city as it is currently being done will continue. Raney answered that it will. “Yes, there are certain items that bulky pick up is not supposed to be picking up, like tires, stuff of that nature. Tires in the alley and roadways is one of our biggest issues we are facing, so we want to provide that option for people to have,” Raney said. Council member Flores said the facility will be very helpful for periods in between brush and bulky pick-ups. It will also assist people who are moving out. Council member Prasifka said some residents were concerned about the garbage getting into the ground, etc. Raney explained that this is not a landfill, it is a collection and transfer facility. In other words, items will not be on the ground. Items are going from their car to a container and then into a compactor, so there will not be debris. An official date of when people can begin taking items has not been set yet, added Raney, as there are many logistics the city is working on. However, they hope to have it running within the next few months or so. •30 gallon bag or bin- $1 for Pleasanton residents and $2 for non-residents. •50 gallon bag or bin- $2 for Pleasanton residents and $3 for non-residents. •95 gallon bag or bin- $3 for Pleasanton residents and $4 for non-residents. •55 gallon drum- $2 for Pleasanton residents and $3 for non-residents. •Freon type appliance- $9 for Pleasanton residents and $10 for non-residents. •Non-freon type appliance- $6 for Pleasanton residents and $7 for non-residents. •Gas grill/barbecue pit- $6 for Pleasanton residents and $7 for non-residents. •King, queen, double- $5 for Pleasanton residents and $6 for non-residents. •Twin- $4 for Pleasanton residents and $5 for non-residents. The ordinance in full and full rate and fee schedule will be available at www.pleasantonexpress.com.